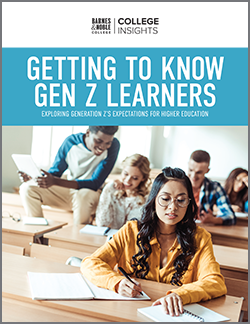 As the student population evolves and learning styles change, ensuring students have what they need to be successful is a growing challenge in higher education. Technology is not the only answer to this challenge, but it can offer many valuable solutions. 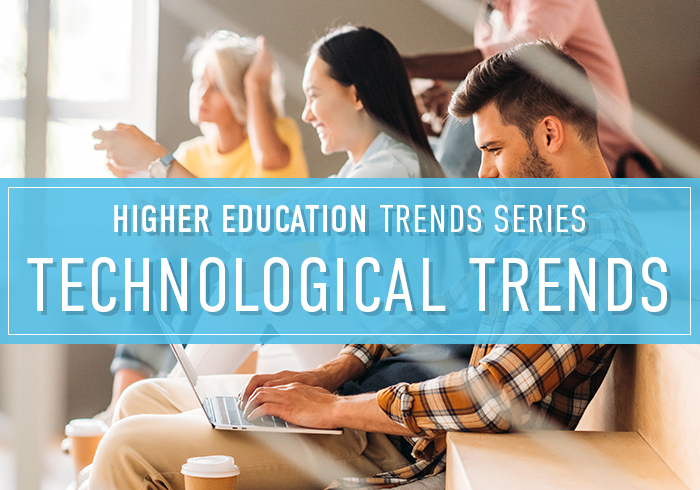 In a recent report on technology trends, The Chronicle of Higher Education made the point that colleges and universities should move away from thinking about student “weaknesses” and focus more on how they can do a better job of serving today’s learners. Following are three trends that illustrate how schools are using technology to achieve that goal. When one student doesn’t have course materials by the first day of class, that student starts out at a disadvantage. When two-thirds of students don’t have their course materials, you have a wide-reaching barrier to student success — that impacts everyone in the classroom and negatively impacts retention rates. An increasing number of colleges and universities are turning to technology to help mitigate this challenge. It’s often not enough to offer digital course materials — factors like affordability and ease of delivery are also important parts of the equation. Inclusive access programs offer a comprehensive solution. Rather than having students find and purchase their assigned course materials independently, schools can now offer discounted digital course materials that are included as part of their tuition. Students have access to their required course materials on the first day of class through their school’s learning management system (LMS). 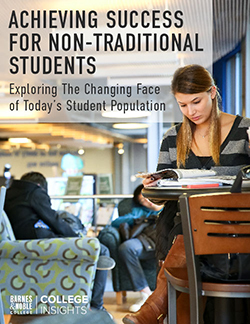 Across the nation, colleges and universities are offering inclusive access programs at schools like Wright State University, Kentucky Community and Technical College System and Penn State Altoona. Not only are these schools seeing high levels of participation, but they’re reporting significant savings for students — and better results in the classroom. As student learning styles and needs change, learning environments are following suit. As reported in EdTech: Focus on Higher Education, collaboration spaces are key to learning. Many colleges and universities have been updating the design of their physical spaces, including libraries, classrooms and campus stores, to reflect this need. In addition to lectures and solitary study, these spaces need to support an ever-expanding amount of group work and collaborative learning. However, as schools work to serve the needs of all students — including non-traditional students, commuters and other students working and living off campus — digital collaborative technologies will become more important than ever. Students need ways to connect with each other and with faculty whenever they’re learning and wherever they may be. Courseware has the capacity to create and support these connections when it comes with built-in tools and functions that tie directly to a student’s course materials. LoudCloud Courseware, for example, allows students to create discussion threads with their classmates. They can post and respond to each other — fertile ground for asking questions, having debates and taking deeper dives than classroom time may allow. Faculty also can monitor and contribute to those threads, enriching the experience and gaining insights into the way their students are digesting and discussing information. With these tech tools, students can participate more fully in the learning experience, engaging at the times and in the places that work best for them. It’s no surprise that, as technology becomes ever-more integrated into students’ lives, they expect to find technology solutions for their learning challenges. Reading is one of those challenges: research shows that only 37 percent of high school seniors are prepared for college-level reading. Finding ways to help students read more effectively is critical to their success. With the right functionality, courseware also can help students create a more personalized reading and learning experience. Digital course materials often include features that give students the ability to highlight text, make comments or even create flash cards. However, more advanced courseware can help students assess their own reading comprehension and ask for help in a more proactive way. With LoudCloud Courseware, faculty can customize their content by including videos and other content enhancements to supplement reading, which reinforces text and provides more flexibility for different types of learners. Self-grading quizzes and other assessments also help students track their comprehension and progress. These capabilities also tie into the collaboration trend, as faculty have greater visibility into students’ activities and results, allowing them to work with students who are having trouble. Students also can flag topics that they’re struggling to understand and send a notification to their professor for help. Such insights equip faculty not only to work with students one on one, but to identify larger trends and address frequent questions with the entire class. Every day, enterprising schools are investing in technology to better understand and support the way today’s students want to learn. The resulting technology solutions are already helping students find greater success today — and will continue to lay the foundation for greater innovation to come.